When you’re piled in a room with hundreds of other people working toward the same goal as you, standing out — in a good way — can seem like an impossible task. 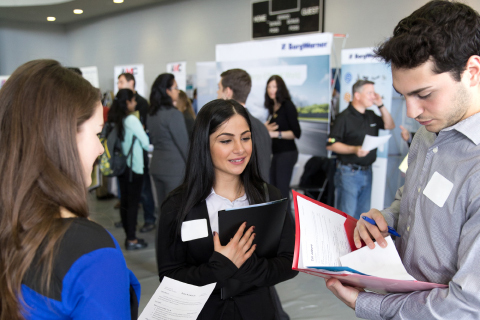 Whether this is your first career fair you have attended or you’ve attended a lot, these tips will help you stand out from the crowd at a career fair. Do your research. It is usually pretty easy to find a full list of companies that will be attending the career fair and where they will be located. Figure out which companies have open positions that best meet your skills and qualifications. While a career fair is a good time to learn about companies, you should know a little about them before showing up. You’ll be able to ask deeper questions and skip straight to your top questions about the company and position without having to discuss the company’s background. Have your elevator pitch ready. An elevator pitch is a quick synopsis of your background and experience. It is important to have your elevator pitch ready before a career fair because it can be difficult to keep it brief on the spot. Check out this article on how to create your elevator pitch and a few examples. Update your resume. Tailor-fit your resume to match potential jobs you are applying for and mimic wording from a few job listings. Don’t be shy. Career fairs are a great place to network and build strong relationships within your future industry. Talk to as many people as possible. You may not get a job offer from every person you talk to but these connections may be helpful in finding a job later down the road. You can never have too many connections in your industry. Ask thoughtful questions. The right questions will show that you have put thought into the company and are interested in learning more. It is not a good idea to ask questions that could be answered with a quick search on the company’s website. This can convey a lack of preparation or interest. Ask for business cards. Business cards provide useful information that will come in handy later if you have questions, want to continue the connection, or send a thank you note. Follow up with a thank you note. Within 24-48 hours, send a thank you note to everyone you met with, even if you aren’t interested in the company. You never know which connections you will need later down the road. Apply for jobs. After meeting with your top preferences, you may have a better sense of which job will be the best fit. Be sure to apply shortly after the career fair so that your name is still fresh in a recruiter’s mind.